Summary: University of Oregon researchers report those who write online journals that note feelings of gratitude develop an increase in altruism. The study, published in the journal Frontiers in Human Neuroscience, sought to determine whether personal altruistic traits could be increased with a writing intervention. “We found that across the whole group at the first session, people who reported more altruistic and grateful traits showed a reward-related brain response when the charity received money that was larger than when they received the money themselves,” said Christina M. Karns, director of the UO’s Emotions and Neuroplasticity Project in the Department of Psychology. Results of functional MRI, which measures the metabolism of oxygen in active brain cells, showed that altruism-related activity increased in the ventromedial prefrontal cortex, an area deep in the brain associated with altruism in previous studies, including one led by study co-author Ulrich Mayr that found increases in pure altruism as people grow older. Next, to test the journaling intervention, the 33 women, ages 18-27, who participated in the study were randomly assigned to two groups. In one, 16 wrote daily in an online journal, responding to prompts with questions related to gratitude. The other 17 received neutral daily prompts not focused on gratitude. 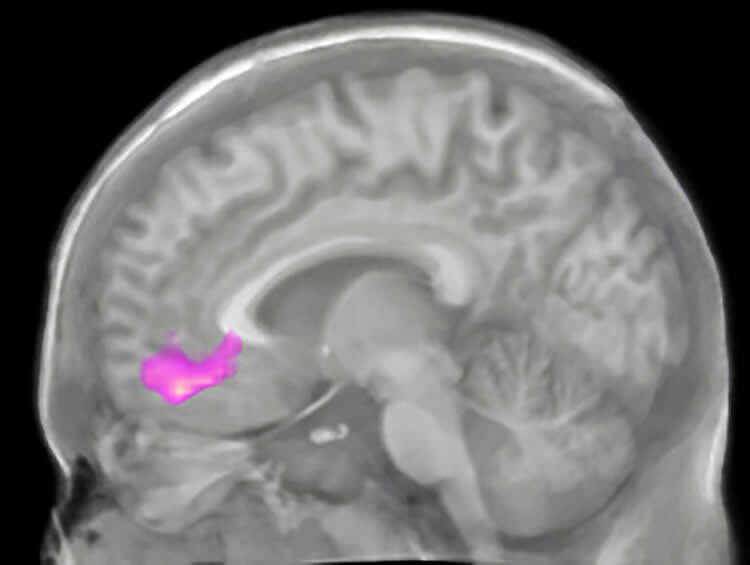 Image captured with functional MRI shows the location in the brain’s ventromedial prefrontal cortex where an increase in neural altruism occurred for a group of women who wrote about gratitude daily for three weeks in an online journal in a study conducted at the University of Oregon. The same response was not seen in a group of women whose journal entries did not touch on gratitude. NeuroscienceNews.com image is credited to Christina Karns. Funding: The research was supported by grants to Karns from the Expanding the Science and Practice of Gratitude Project through the Greater Good Science Center, in partnership with the University of California. Karns also received support from the Lewis Center for Neuroimaging at the University of Oregon and The Templeton Religious Trust via the Institute for the Study of Human Flourishing at the University of Oklahoma. Image Source: NeuroscienceNews.com image is credited to Christina Karns. University of Oregon “Journaling Inspires Altruism Through an Attitude of Gratitude.” NeuroscienceNews. NeuroscienceNews, 14 December 2017. University of Oregon “Journaling Inspires Altruism Through an Attitude of Gratitude.” http://neurosciencenews.com/altruism-journal-gratitude-8189/ (accessed December 14, 2017).